It all began back in 1983 when a Frenchman named F.R. David releases his second single "Pick up the phone". Dieter Bohlen, a composer and producer for Intersong, is very excited about this song. (If you want to know more about Dieter Bohlen, click on the link in the main menu). He wants to make a German production of this song, but he hasn’t a suitable person to sing it. However, he has decided the song title: "Was macht das schon?" A few days later he gets a telephone from a record company in Berlin which is called Hansa. They have a singer who already has recorded some songs, but he hasn’t had made the charts yet. His name is Bernd Weidung and he likes the idea of singing Bohlen’s songs. Bernd flies to Hamburg at once and he and Dieter seems to get well along together. Later that year Dieter wrote the song "Wovon traüst du denn? ", and finally Thomas hits the charts. On the 1st of October the record has sold about 30.000 copies. In March and June the next year, Dieter and Thomas releases two more singles. They’re called "Endstation Sehnsucht" and "Heibkalter Engel". After five years of hard work, Dieter takes a holiday. He flies to the isle Mallorca, and during his stay there he comes up with many new ideas. Bernd Weidung spent his holiday together with his girlfriend Nora Isabell Balling on the island Gran Canaria. Here they become engaged on the 6th of August 1984. When Dieter and Bernd are back in Germany, they begin to work at once. Dieter has written and composed a song:"You’re my heart, you’re my soul" and the two guys has agreed to form a duo. 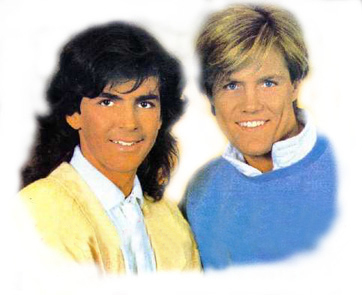 They call themselves "Moderne Gespräche", but they changed it to "Modern Talking" because it sounds more international. Bernd Weidung changes his name to Thomas Anders. Modern Talking performing "You're my heart, you're my soul". In October ’84 the single, "You’re my heart, you’re my soul" is ready and released, but nothing happens. It seems that no one knows or has discovered Modern Talking. A month later, Thomas manages to crash his Volksvagen Golf GTI, but he and Nora are unhurt. After this happening, a clip from "You’re my heart, you’re my soul" is shown in a TV programme, on the 17th of January 1985, named "Formel Eins". 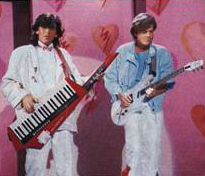 People like what they see, and a few days later Modern Talking is invited to a very popular TV programme, "Tele-Illustrierte". In this programme Dieter and Thomas presents themselves, and finally Modern Talking breaks through. "You’re my heart, you’re my soul" stays on the German charts for half a year and this single was a big hit outside Germany as well. In March ’85 the second single "You can win, if you want" is released. "You’re my heart, you’re my soul" is still very popular, but the new hit from Modern Talking rules the charts for weeks. A few weeks later, "The first album" appears and on this album there is a song named "There’s too much blue in missing you". Apart from the other songs this one is sung by Dieter and not Thomas. Thomas is only singing in the background. This little "secret" was discovered when Modern Talking performed the song on television. 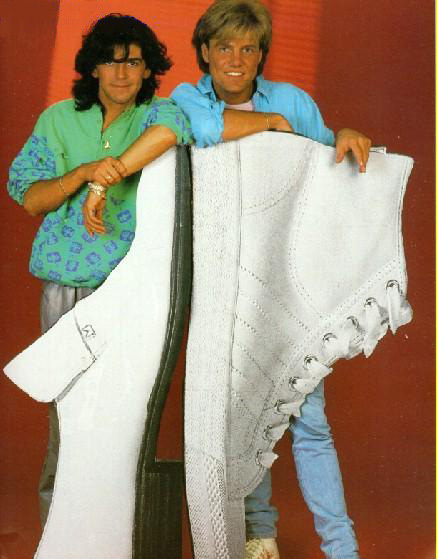 In September the same year, Modern Talking is invited to "Peter’s-Pop-Show" and here they received 75 golden and platinum records because of their success all over the world. A lift truck was required to get the records in and out of the studio during the TV-programme. While their album and two singles are still on the charts, Dieter is almost finished with the second album "Let’s talk about love". While he is doing this he records "The night is yours, the night is mine" for a second time. This time he releases it under the name of "Ryan Simmons". Most people don’t know this and the news takes them by surprise. What’s going on?? Has Dieter gone totally mad?? This is the first sign of resentments between the two. If you didn’t know, Thomas sings the song on "The first album". In interviews later on, Dieter complains about Thomas and that he’s not working hard enough. He said he had spent two months working on the album, but Thomas had only spent two days in the studio singing the songs. During concerts Dieter and Thomas starts to argue with each other and now it’s clear that something is going on. In the middle of 1985 Thomas gets a nervous collapse. During all this mess their third single "Cheri, cheri lady" was released and this also became a hit later on. On the 27th of July the same year, Thomas married Nora in Koblenz. Outside the church was 3000 crying female fans, but Dieter didn’t turn up because of his father had a heartinfarct. Anyway, Dieter didn’t like Thomas’ and Nora’s life style and their way of spending money. They used them on all kinds of luxury, not thinking about that it was Dieter who had made Thomas so popular and who had given him the chance to make such money. Before Thomas and Nora married, Thomas had lengthen his contract with two years; until the end of 1987. After the release of "Let’s talk about love", Dieter wrote and composed their fourth single "Brother Louie". Beside "You’re my heart, you’re my soul" this is maybe their best known single. 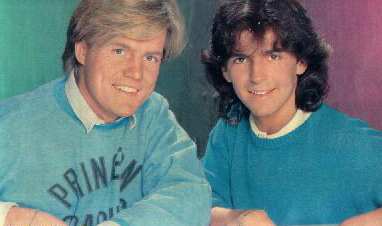 This single was so popular that Modern Talking earned an award which was supposed to be handed over to them in the TV-programme "FormelEins". Thomas didn’t turn up here, neither in "P.I.T" some days later. On the 27th of May 1985, Modern Talking was supposed to tour all over Germany. This time Dieter didn’t turn up because he had injured his arm while playing tennis. Thomas had to do tour alone. Journalists in the German papers didn’t write about Modern Talking anymore, only about Thomas and Nora. Dieter managed to save Modern Talking from losing their fans although he didn’t care anymore. After this, the journalists started to invent stories about Thomas and Dieter, and Thomas went beserk and sued the papers. He lost his case and this happening gave the journalists even more to write about. After all this, Dieter and Thomas were nearly ever seen together. When they won an award or some sort of prize, only one of them turned up. Never both. The last time they appeared together was in the end of 1986 on the "Formel-Eins" tour. This was planned to be a huge tour, but a war broke out between Dieter and Nora. Modern Talking’s concert at Circus in München became a disaster because Dieter and Thomas had started to argue a few minutes before they were going on stage. Both of them refused to be seen with one another, but in the end they got on stage. Their first song to be performed was "Brother Louie", and for this song Dieter had hired two dancers: Sylvia Zuniga and Biggi Nandke. As the song begins to play, the two girls are not on stage. Nora, who had invited herself and her female friend Jutta Temes backstage, had told the security guards to not let anyone pass through. When the two dancers arrived an hour or so before the concert, the security guards had told them that they were not allowed to pass. They though the two girls were fans, even Dieter had told them he expected two female dancers. During "Brother Louie" Nora and Jutta goes on stage. Dieter doesn’t understand why THEY are on stage and not the two dancers. After the song has ended, Nora, Jutta and Thomas leaves the stage leaving Dieter alone. He apologizes to the fans for the happening and then he leaves the stage as well. Everyone understands that the concert is over. Backstage, Nora emties her rage on Dieter so loud that everyone is able to hear her. She doesn’t understand why she can’t be on stage together with Thomas. Dieter answers:"You have nothing to say here. You haven’t worked on any Modern Talking song". The fans got very irritated on Nora as well as the papers. Dieter soon realized that Modern Talking couldn’t be saved anymore. Thomas was totally manipulated by his wife, and he wasn’t willing to co-operate with Dieter anymore. It was clear that Nora had made a trio of Modern Talking. Dieter’s music and future was very important to him and he would not let it be destroyed by a mad woman. It was obvious that Dieter and Thomas were fed up with each other, and that they were going to split in the near future. 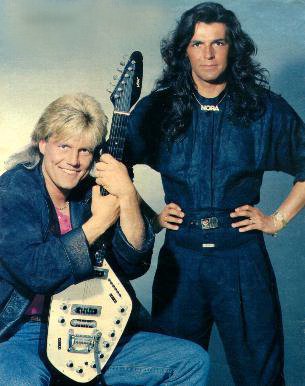 But the contract that Dieter and Thomas had signed, demanded that Modern Talking should exist until the end of 1987. It was still a year left. In the studio, Dieter planned his musical future without Thomas. At this time he was planning a new project called "Blue System". (If you want to know more about Blue System, click on the link in main menu). 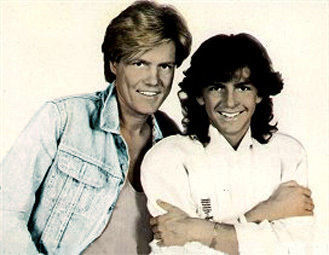 Modern Talking on their last single in the 80's, "Locomotion Tango"
Modern Talking was one of the 80’s most popular duos. They had five number one hits in a row ("You're my heart, you're my soul", "You can win if you want", "Cheri Cheri lady", "Brother Louie" and "Atlantis is calling"). Their sixth single, "Geronimo’s Cadillac", was the exception. All the attention was drawn away from Modern Talking’s music, and over to the behavior of Nora which gave Modern Talking a very negative profile. Nora placed herself in front of Modern Talking, she wanted to take credit for Dieter’s work. Even though she didn’t have a contract she was always present. She didn’t allow Dieter and Thomas to be photographed together. When Thomas gave an interview, Nora was always by his side. People disliked the way Nora behavied and this resulted in that people began to dislike Dieter and Thomas. 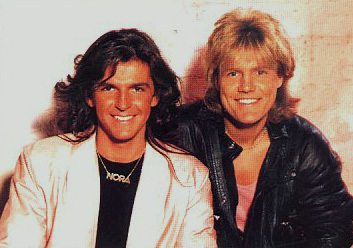 The papers invented rumours like: "Dieter Bohlen and Thomas Anders are gay" or "Modern Talking - the gay duo". 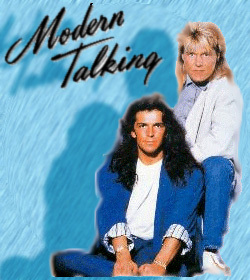 More information about Modern Talking in the 90's coming soon! !